For the 24 hours to 23:00 GMT, the EUR declined 0.37% against the USD and closed at 1.1465, amid continuing political uncertainty over Italy’s budget. In the US, data indicated that, the Chicago Fed national activity index eased to a level of 0.17 in September, less than market expectations for a decline to a level of 0.21. The index had recorded a revised reading of 0.27 in the previous month. In the Asian session, at GMT0300, the pair is trading at 1.1461, with the EUR trading marginally lower against the USD from yesterday’s close. 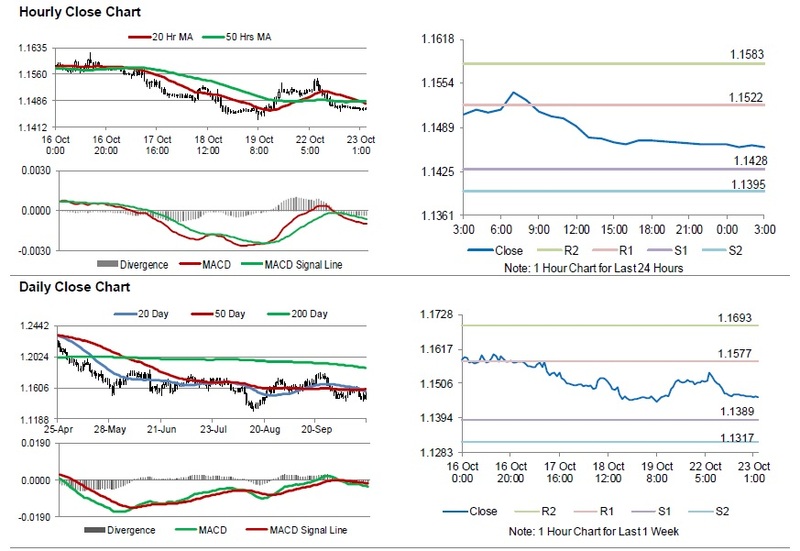 The pair is expected to find support at 1.1428, and a fall through could take it to the next support level of 1.1395. The pair is expected to find its first resistance at 1.1522, and a rise through could take it to the next resistance level of 1.1583. Looking ahead, traders would await the Euro-zone’s consumer confidence index for October, along with Germany’s producer price index for September, set to release in a few hours. Later in the day, the US Richmond Fed manufacturing index for October, will garner significant amount of investors’ attention.